Commander Instruments and Avionics, Inc. Commander Instruments and Avionics specializes in supporting FBOs, Maintenance Service Providers, Flight Departments and Corporate Flight Departments with new instruments and radios, systems, components, parts, and technical assistance for products sold. Commander is an authorized dealer by Appareo Stratus for sales, service, and installation. ADS-B is the technology being implemented by the FAA to provide surveillance and improved situational awareness to both pilots and air traffic controllers. 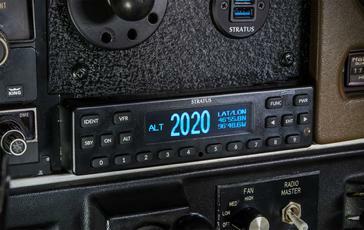 The FAA mandate states that all aircraft operating in current Mode-C airspace must be ADS-B Out equipped by 2020. For the pilot, the two primary benefits come in the form of ADS-B In weather and traffic information. Free weather information is transmitted from ADS-B ground stations. CONUS NEXRAD, regional high-resolution NEXRAD, METARs, TAFs, TFRs, AIRMETs, SIGMETs, NOTAMs, winds/temperature aloft and pilot reports are continuously delivered to you in-flight via ADS-B In receivers, such as Stratus. An ADS-B ground station will send a traffic picture when it is ‘pinged’ by an ADS-B Out transponder, such as Stratus ESG. Individual traffic targets can also be received directly (air-to-air) from other ADS-B Out equipped aircraft. Equip your aircraft with Stratus ESG to experience the full potential of ADS-B traffic. An FAA mandate requires all aircraft flying in current Mode-C airspace be equipped with ADS-B Out before 2020. Appareo has developed an ADS-B Out transponder that’s ideal for non-glass panel aircraft. 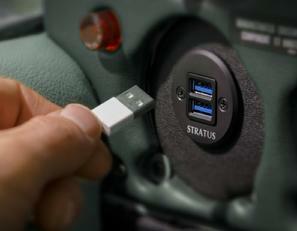 Stratus ESG includes a 1090 ES transponder and certified WAAS GPS in the same box. It’s truly an “all-in-one box” solution. © Copyright 2019 by Commander Instruments and Avionics, Inc. All Rights Reserved.